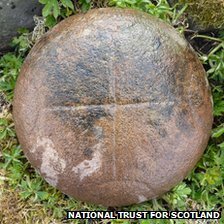 An early Christian bullaun and turn stone have been discovered on the Scottish Inner Hebrides island of Canna. A bullaun is a large rock that has one or more depressions into which stones were turned as part of a folk ritual that started in prehistory and continued well into the Christian era. 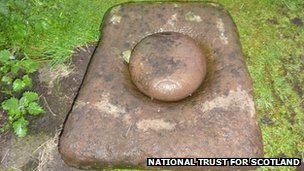 Bullauns are common in Ireland, but rarer in Scotland, and this is the first Scottish one that has been found complete with its matching top stone. The island was bequeathed to the National Trust for Scotland by Gaelic folklorist John Lorne Campbell in 1981, and the organization maintains it as a conservation area. NTS ranger and Canna native Geraldine MacKinnon found the turn stone first in Canna’s graveyard. The round stone is approximately 10 inches in diameter and engraved with an early Christian cross. The NTS head of archaeology alerted manager Stewart Connor to the find and that it might be linked to a stone with the characteristic bullaun depression next to Canna’s Celtic Cross, an unusually carved stone cross that dates to the 9th or 10th century. Too excited to wait until the next morning, Connor went out at 9:00 PM and found that the stone fits perfectly into the depression. 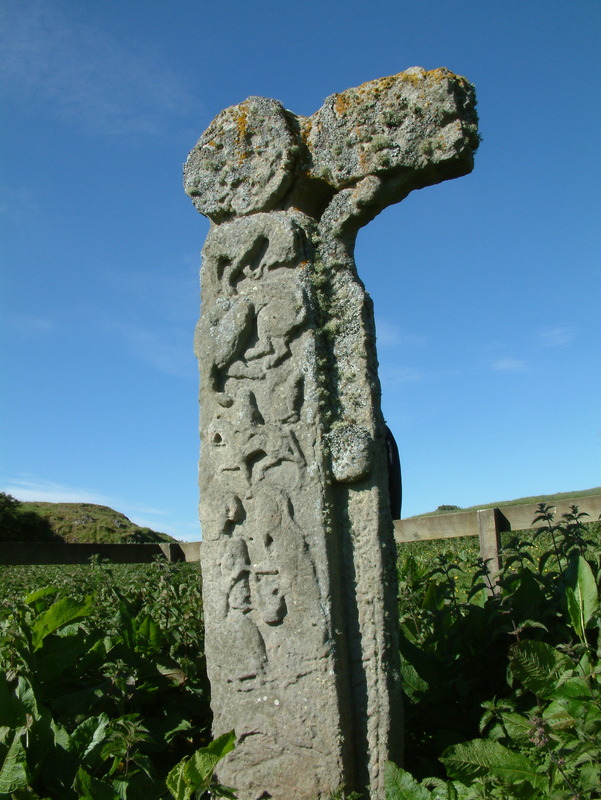 Bullaun, despite their pre-Christian heritage, are often found next to early Christian churches, monasteries and artifacts like the Celtic Cross. Canna was owned by the monastery of Iona by 1203, and historians believe it may have belonged to Iona as early as the 7th century. In Ireland, folklore attached magical significance to bullaun stones, such as the belief that rainwater collected in the stone’s hollow could have healing properties. The St Brigit’s Stone in County Cavan in Ireland was used as a “cursing stone”, and locals would turn the stone while cursing a sworn enemy. There are a number of archaeological remains on the island dating from this period, including a series of highly decorated cross shafts and the hermitage site Sgor Nam Ban-Naomha, or Skerry of the Holy Women, a remote location hidden below steep cliffs which was discovered in 1994. This entry was posted on Sunday, May 20th, 2012 at 11:59 PM	and is filed under Medieval. You can follow any responses to this entry through the RSS 2.0 feed. You can skip to the end and leave a response. Pinging is currently not allowed. What a novel discovery. One can’t help but think the people of by-gone ages had some topping ideas. Cursing stones! What could be more cathartic than muttering denunciations against some bounder whilst grinding a stone. By-the by, did you know that one woman visited travelled to some place or other to invoke the cursing stones against Hitler. Every little helps I suppose. I did not know that Hitler was cursed with the cursing stones. I’m delighted that it worked. Thanks for sharing this, very interesting. Tory Island has its own tale of a cursing stone. Supposedly, the sinking of the HMS Wasp in the late 1800’s was due to the islanders using a cursing stone to prevent the ship from coming to their island to collect taxes. Mysteriously, the cursing stone went missing shortly after the shipwreck, but its pedestal remains on the island. I was so intrigued by this tale, I used it as the basis of my paranormal fantasy novel, ISLAND OF TORY. The sequel, appropriately named CURSING STONE, is due for release in March. You can find out more at http://www.reginamgeither.com.